Why have I never heard of this place? In fact, why is nearly every national monument I see on the map a complete mystery to me? I’m embarrassed to be so ignorant of the facts of our county, but on the other hand, I have a problem with getting overly excited about places and things I read about, so on this trip I’ve been trying to figure out what will be interesting without learning too much. 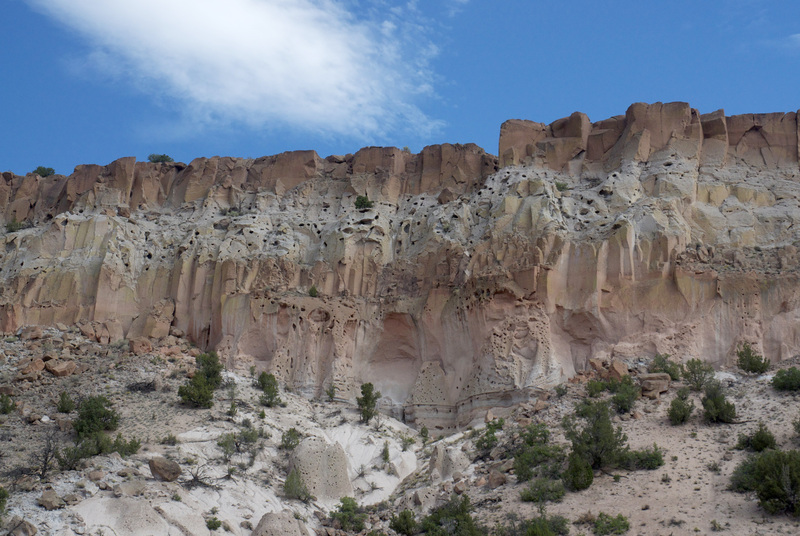 I’m predisposed to like Bandelier National Monument, if only because I really want to get out of Santa Fe. For nearly a week we’ve explored wide open spaces with skies that went on forever, and I’m feeling a little claustrophobic in the suburban sprawl. I can’t get my bearings. I’m eager to spend one whole day outdoors and on my feet. The scenery on the way there is fascinating. I’m ready to jump out of the car right now and explore! We arrive in Los Alamos, where we have to take a shuttle the last 20 minutes to the park. There was a flood a while back and…well as far as I can tell the shuttle was probably needed for a few months but now no one wants to fire the drivers, because I can see no reason we couldn’t have driven right in. Everything is fine. Anyway, the park is way better than I expected. 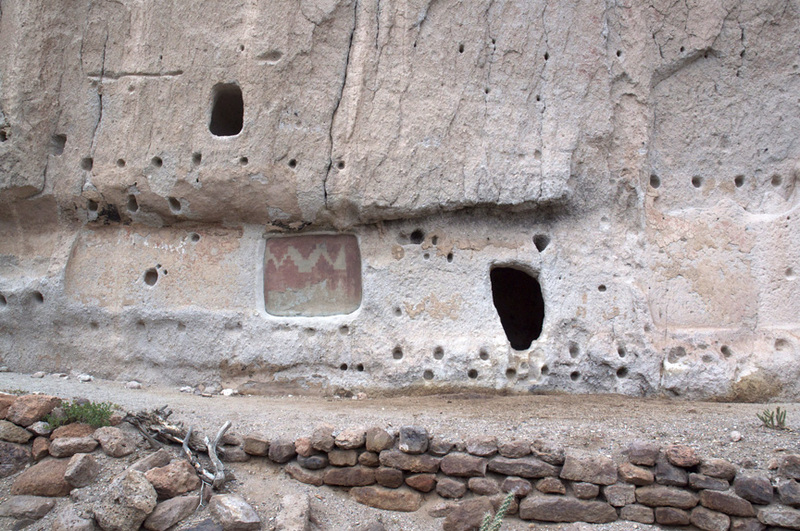 A pretty, 2-mile round trip totally level walk along a river canyon, with native American stone houses and cave dwellings. This rock, if I remember correctly, is actually compressed ash from a volcano, and this lends itself to all the cool, naturally occurring caves and holes! 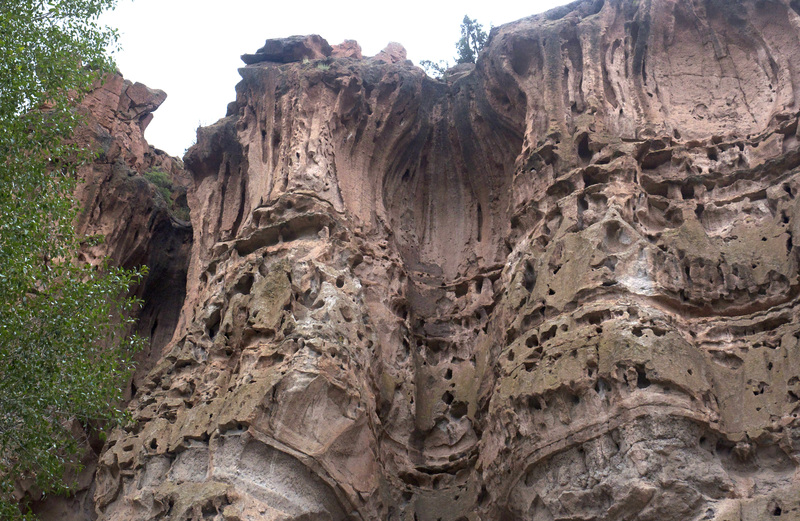 You can see, on the photo I took when we were driving in, these holes are everywhere in this area. This seems like a good place to live in olden days. I like that you can still see evidence of wallpaper, aka plaster with decorations. The round holes are where the logs for the roofs were secured. 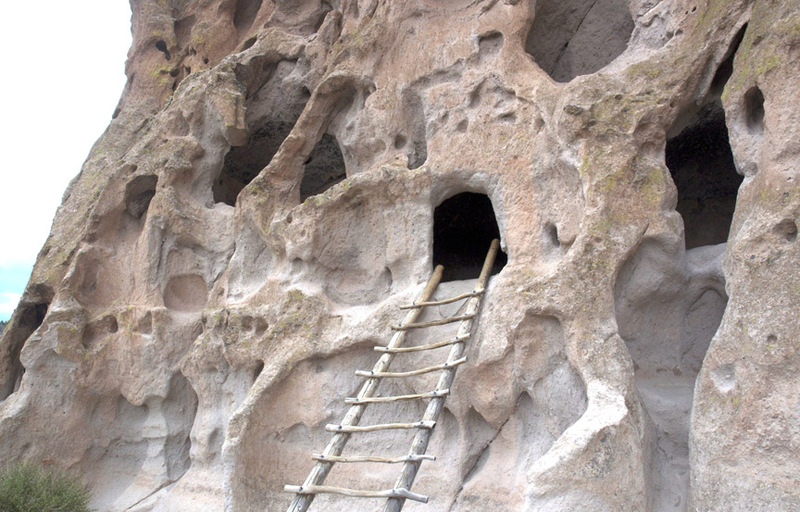 The best part is that, at the end of the trail, you can climb up a sheer cliff face on wooden ladders to get to a really big cave. I’m amazed this is legal in the U.S.! Wow! I hate to even write about this because I don’t want to bring this to the attention of the wrong person–who will start a campaign to get the ladders removed. None of my pictures can do this justice so I won’t bother posting them. Instead here is another neat scene. You can get an idea of the scale from the tall pine (?) tree up on top. That night after dinner we met our friend Aneel–coincidentally also on a southwest road trip–at a nearby dive bar. I felt very out of place when we walked in. Everyone but us was dressed up in southwest style garb, well over 60, completely drunk, and dancing to an extremely loud cover band. There was one thing I could do to fit in, and it wasn’t dance. After a few drinks I began to relax it all made more sense. These retirees were Getting Down! I haven’t seen such enthusiastic dancing in a long time. They spun, they waved their hands in the air, they ground pelvises. After each song ended, the dance floor emptied as everyone collapsed into chairs for a breather, but once the band started they jumped up like jack in the boxes. They were having a blast! It was an inspiration. I saw my future and I wasn’t sitting in my front room yelling at the hovering drones the pesky teenage kids were using to spy on me. I was in Santa Fe in a dive bar swing dancing with a cowboy. Yee haw! This entry was posted on September 7, 2012 by roadtripz. It was filed under 2012 travel, Road trip, U.S. travel .